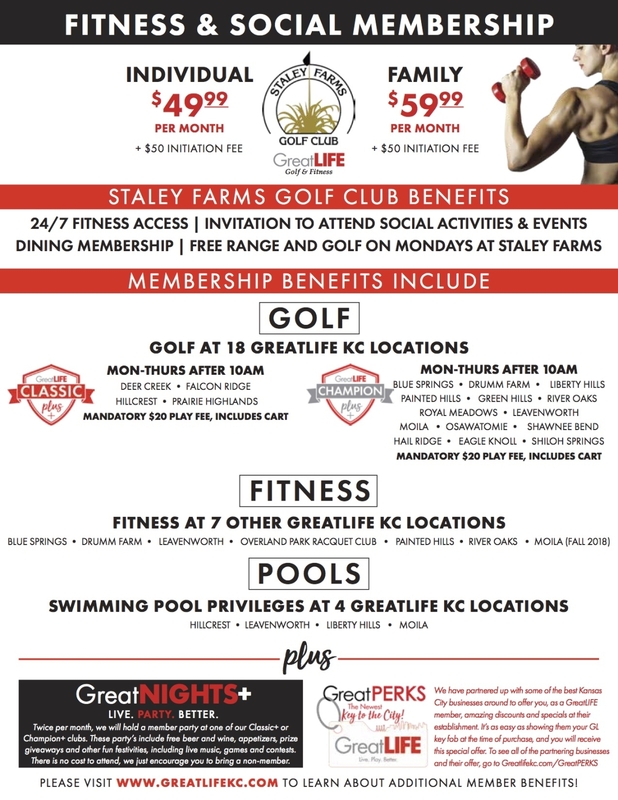 The Social Membership allows an individual or family access to the social amenities offered by Staley Farms Golf Club. As a social member you will have access the food and beverage facilities (Golf Clubhouse), and an invitation to all social events including theme dinners and holiday parties. As an added perk, social members can play free golf on Monday as well as have access to the range. Another GreatPERK is our Social Memberships are able to use 18 of our other GreatLIFE courses Monday-Thursday after 10am (includes cart)! Contact our Membership and Marketing Manager today to get signed up! The Dining Membership allows an individual or family access to the dining amenities offered by Staley Farms Golf Club. Those amenities include dining events such as Sunday brunches, 4th of July, Halloween and New Year’s parties. You also have the opportunity to entertain family members and guests in our clubhouse. Included is access to clubhouse meeting rooms or banquet space for your private function. All members are subject to the same rules and regulations. Denim is allowed in the clubhouse, but may not be appropriate for some events or may only be allowed in the bar & grill.